The XMark Adjustable Dumbbell set is a revolutionary new way to think about weight lifting equipment. Most weights come in a fixed weight. This means that weight lifters have to own several different sets of weights to properly work out their bodies. The purchase of all of these elements can be a pricey way to work out. XMark changes this by providing a set of two adjustable dumbbells that can be changed with nine different plates to suit the needs of each individual. Currently on Amazon this product is sold for between $161 and $279 depending on the weight choice. The product comes in either a 25 lb allowance or a 50 lb allowance depending on the needs of the consumer. You can be sure it’s a pretty popular choice -it made it to our top picks for the Best Adjustable dumbbells of this year. If you are looking to train from the comfort of your own home, the XMark adjustable dumbbells are a great selection. They make training every part of your body simple with nothing more than a pair of adjustable dumbbells. Otherwise, it would be necessary to purchase individual dumbbells. Considering the variety of moves necessary to get a total body workout with each requiring a different weight for your abilities, this can be quite costly. Additionally, the purchase of these dumbbells doesn’t offer much room for growth. As you get stronger, you need heavier dumbbells and the lighter ones become obsolete. The XMark dumbbells were clearly created with this in mind. The XMark dumbbells are easy to store. The provided trays take up minimal space and still make it easy to access the individual plates. Changing the weight on a dumbbell is a simple process that takes only a few seconds. 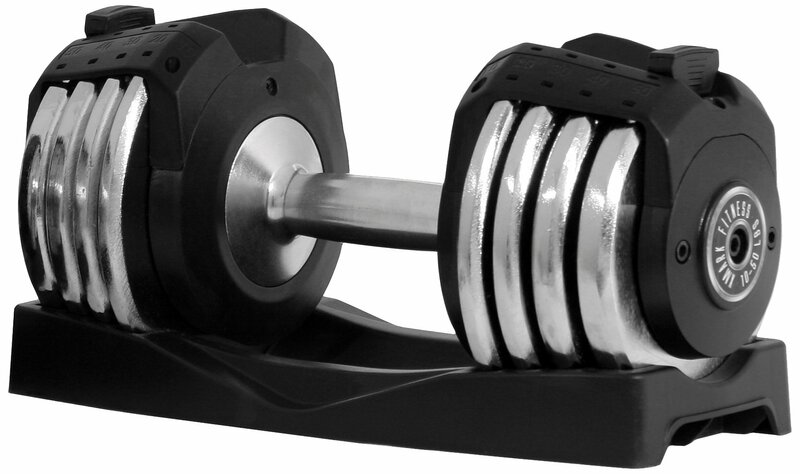 The dumbbells work with a lever system that allows new weights to be added or removed safely. The equipment was clearly made to last. The dumbbell bar is of solid construction as are all the parts involved. The plates are made of chrome plated steel and can withstand just about any force that you can put them through. Lifting with this product is just like any other commercial set of dumbbells. The dumbbell grip is comfortable and non-abrasive. This set can be easily used in conjunction with lifts that target many parts of the body including the arms, legs, shoulders, chest, back, and shoulders. Though the easily adjustable system is a huge bonus for most consumers, a few have reported some trouble with the adjustable lever system. For many, the lever easily slides to accommodate the weight that you desire. However, several months into their usage of the product, a handful of consumers reported that their lever sets became a bit more difficult to slide for the necessary weight adjustments. The plastic tray set perfectly fits the various plates included in the product package however some customers have displayed discouraging attitudes toward the fact that the portable tray set is plastic. The heavy duty plastic tray system allows the plates be stored with minimum storage room and is molded perfectly to fit the various plate sizes. Nonetheless, some have been a bit wary of the product design, though none have reported problems. While the XMark Adjustable Dumbbell set is a great space saving option, there are some other exercise options that take up even less space. Resistance bands, for example, take up virtually no space while yoga can be practiced with nothing more than a thin mat. These options, however, offer less versatility in weight training and body building than a dumbbell set does. While the XMark has a couple of minor issues, it offers customers a great home gym weight system and is ideal for its price class. At a higher price, other products offer a more expansive weight plate set, however, XMark is clearly one of the best products in its class. Its well-constructed elements are durable and can be easily adjusted to meet the needs of each individual lifter. Additionally, the product can be stored compactly with the tray set storage space that houses all of the weights efficiently and safely. The equipment is easy to maintain and features a comfortable, smooth grip, making lifting easier. For the same price, a consumer could buy only a small set of individual dumbbells. These dumbbells would take up much more space and would not allow for personal growth. Overall, for the price, the XMark Adjustable Dumbbells are an excellent selection for the price point.